We are delighted to announce two new additions to our fast-growing team over the past few weeks. Kale Law has joined New Narrative as Business Development Executive. Previously Kale was at Thomson Reuters, where he led the growth of the Eikon messenger community in Hong Kong, enabling portfolio managers and traders to connect and trade with financial professionals around the globe. Prior to that, Kale worked with the Economist Group, where he supported the business development efforts of the group’s integrated solutions team in Hong Kong; and Asian Private Banker, where he expanded the publication’s events and advertising business among private banks and asset management firms. In his new role at New Narrative, Kale will contribute to business development initiatives across our growing client base of global banks, asset managers, and professional services, healthcare and technology firms. Kale holds a BA in History from the University of Toronto. Separately, we’re pleased to welcome Jourdan Ma, who has joined New Narrative as a Content Executive. Jourdan will play a key role in the development of content for our diverse roster of clients across a range of formats, from infographic concepts to social media and event coverage. She will also support the in-depth research that informs many of our consulting engagements and content campaigns. Jourdan, who holds a degree in English from the Education University of Hong Kong and a master’s degree in international journalism from Hong Kong Baptist University, joins New Narrative from Hong Kong daily The Standard, where she was a features reporter. Coming fresh off a handful of events that didn’t lack for the latest industry jargon, and despite our decidedly mixed feelings about the use of buzzwords, it is easy to understand marketers’ need to dabble with them. These terms resonate with a wide audience (even if not everyone entirely understands their meaning) and signify a grasp of the latest trends. Of the terms we’ve heard the most in recent weeks – blockchain, crypto, deep learning, fintech and natural language processing – the last one stands out in this context. This is the technology that informs the algorithms of online search engines – the agenda setters of our day – parsing through millions of lines of text to decide what’s most relevant and channelling it to the right eyeballs every time someone keys in a word or phrase. This is where search engine optimisation (SEO) comes in – the science (some might call it the art) of getting your content to the top of millions of search results, and front and centre of users searching for information on a topic. A good SEO strategy, as this post notes, involves everything from understanding the workings of a search engine’s algorithm to figuring out the right keywords to weave into the copy, getting those title tags, meta descriptions and even photo captions just right. While all this may sound intuitive enough, it can be challenging to put into practice, especially when one is regularly churning out content across a range of formats. *Keyword strategy: Identify a primary keyword – one that best describes the main topic – and use it in the headline, lead paragraph, the URL, and throughout the article. Next, pick a handful of secondary keywords that are related to the subject at hand for use in the article where relevant. But, avoid ‘keyword stuffing’. *Using links: Make sure to include links to external sources (always a good practice to attribute) as well as internal links encouraging users to click through to other content on your site. *Optimize your site: SEO is not limited to just sprinkling the right keywords in an article. It is important to have an organized, mobile-friendly website that is free of broken links, and easy to navigate with a seamless user experience and fast-loading pages. *Social media: Share posts on relevant social channels with the right hashtags to maximise exposure and shares. *Quality content: Lastly, it’s useful to remember that good content is more powerful than any SEO tactic. Useful and relevant content will generate organic traffic and help improve your website ranking. And, as other websites begin to link back to yours, that can do wonders to site rankings and online presence. How long should an article be to ensure maximum readership and engagement, and how many words does it take before eyes glaze and readers keel over? The ideal word count question is one that marketing professionals (and journalists) wrestle with all the time. The bad news is there is no magic number, and several factors need to be considered to gauge the ideal length of an article – such as the intended audience, subject matter and the ultimate objective. But we’ve pulled together some data to help marketers address this issue and navigate the constantly shifting online content ecosystem. If the aim is to provoke a discussion, snappy posts of 300 words or less are ideal, according to this guide. But, if readers are to be encouraged to share a post widely, it needs to be longer – between 1,000 to 1,500 words. Word counts between 300 to 750 are deemed to be a workable compromise for garnering a respectable number of online shares with some engagement. To maximise shares across platforms such as Facebook, LinkedIn, Twitter and Google, some estimates show that articles ranging from 3,000 words to as much as 10,000 fare best. This post compiles figures from several sources to propose subject-specific word counts that do justice to the topic at hand while helping with social media shares and high page rankings. Articles on finance are estimated to require between 2,100 to 2,500 words while technology-focused write-ups are best limited to around 1,000 words. The ideal length for posts on real estate is deemed to be between 1,800 and 1,900 words while marketing or advertising-related articles work well when they are close to 3,000. Some research focuses on the time readers are most likely to spend on a given article, which according to one estimate works out to seven minutes. Which brings us to the question of why longer pieces seem to be in vogue at a time when fewer people are reading articles in their entirety. This could be due to the frequently changing search engine algorithms at Google, which tends to have an outsized influence on what users see when they search for online content. Past research has shown that lengthier articles ranked higher on Google’s search results, with the average length of content that showed up on the first page of Google’s search results pegged at 1,890 words. These metrics make a significant difference in a world where search engine algorithms determine the content presented to readers and how they consume it. How many of us click through to the second page of results after typing in a search word or phrase? Getting the word count right is crucial. That part is not up for debate but it’s also true that quality usually trumps quantity. If an article is unreadable its length becomes moot. It’s best to get the content right before worrying about hitting that magic number. 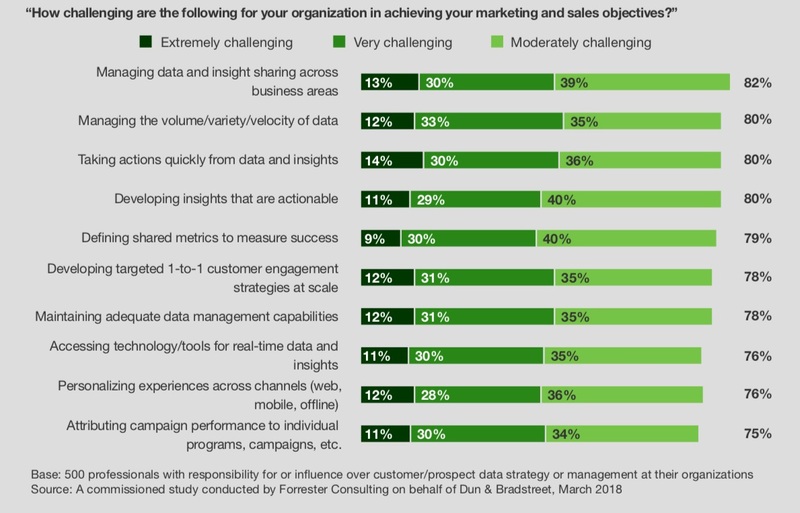 While statistics can make content more credible or help make a point in fewer words, it is tricky getting numbers to tell a story, and developing actionable insights from data is among the top challenges for marketers. By considering these key factors you’ll be off to a good start. To keep the story on point, try to summarise it in a single headline or tweet, as this post in the Harvard Business Review suggests. Select one or two key data points or insights – the more unique the better – that support this core message and lead with them. Also resist the urge to cram as much supporting data into a piece as you can; few things provoke as many yawns as a sea of numbers and just a couple of strong statistics can add more weight than dozens of middling ones. Any data you leave behind can always be used in the future. Especially when working with external data, take extra care to ensure its provenance. Always look for original sources and vet their reliability. Databases of governments and world bodies, research agencies, industry associations and renowned think tanks are good places to start. Also make sure to be transparent about where your data came from and how any conclusions are reached. Attribution is key, especially when working with third-party data, as it burnishes a campaign’s and the organisation’s credibility — whereas failing to attribute data properly does quite the opposite. Read more about that here. To cut through the jumble of data, make comparisons and look for trends, patterns and relationships to coax out relevant findings. However don’t overstretch in the desire to make connections, and make sure you’re comparing rough equivalents. Contrasting the economic data of cities with vastly different population sizes, for example, is unlikely to yield anything worthwhile. Most importantly, look for (and test) findings that are genuinely counterintuitive or run against the grain, which are virtually guaranteed to attract attention and provoke debate. To paraphrase behavioural economists Amos Tversky and Daniel Kahneman: No one ever made a decision because of a number. They need a story. Data-driven stories are as much about the narrative as they are about the numbers. So, it’s necessary to step into the audience’s shoes and ensure a piece flows logically from one data point to the next. Keep it simple, avoid jargon, and include anecdotes and real-life examples that will help the audience readily relate to the information. Here’s an example from the South China Morning Post that weaves a compelling narrative about the Belt and Road Initiative through interactive charts, maps and graphs. Given that the numbers are the story, make the presentation as visual as possible to break down complex findings and drive home the message. Research has shown that the human mind can’t process numbers beyond a certain level (read more about that here) so it helps to provide visual aids. Charts, infographics and interactive tables, used with a strategic combination of colors, can convey the data in a striking yet easy to digest manner. This selection from the New York Times provides a good overview of the various ways data can be presented. Considering that the entire exercise is aimed at engaging the audience, make sure to create an opening for interactions. Invite, encourage and drive discussions around the story; guide the audience to information that complements the material at hand; and, seek feedback. Gathering statistics on what your audience likes and dislikes can provide you with fresh data to inform the next stage of your publishing plans.